Imagine marking attendance everyday as present or absent on the register everyday for all student in every class. It’s a tedious task for a school which doesn’t have a school automation software like ECAS (Enhanced Campus Automation System). Let’s have a brief idea about the Attendance Management Software module in ECAS. 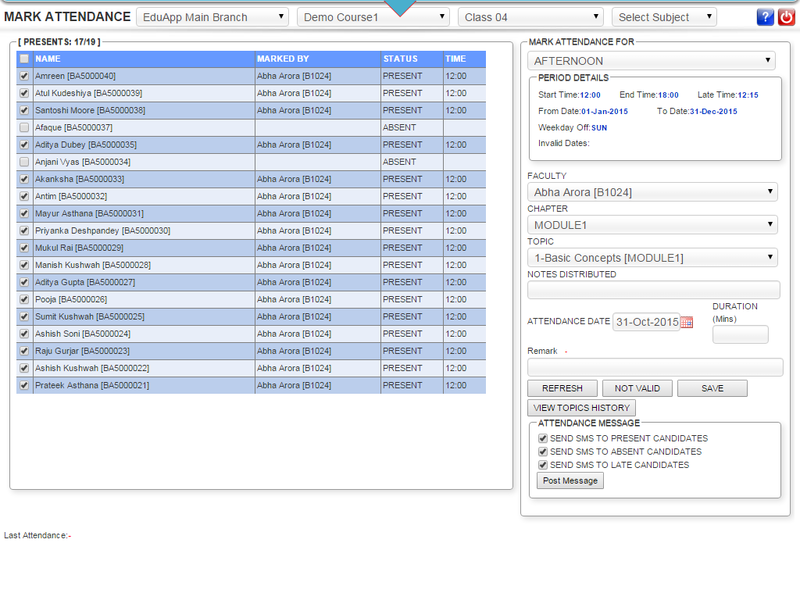 The attendance recording panel displays the list of students that are registered for that particular course or class. As a default to save time all students are marked present. The candidates field that are left unchecked are marked as absent automatically by system logic, thereby saving time of the faculty teacher. To mark a student absent the faculty can just unchecked the checkbox provided next to the student’s name which is marked as present. In the same panel, present, absent or late arrival SMSs can also be sent if required. These attendance records are stored and updated in the database for every class. ECAS uses such highly advanced techniques to mark attendance automatically from Smart card machines and Biometric devices. This saves more time as compared to manual attendance marking. Some institutes use bar-coded identity cards or RFID based Smart Card for the students and employees where they have to scan their IDs before entering or leaving a class in Smart card machines. Some institutes also use Biometric machines for attendance that recognise the candidate on the basis of either thumb impression or face features.These machines run on a server and update such time-in/time-out logs on a real-time basis. These records can be obtained in Excel or CSV format from the machine database. The administrator can login to their account in the campus automation software and import the Excel or CSV file by clicking on Import button, the attendance is automatically marked and updated in the database for the selected period setting . Officials with user rights and permissions can draw attendance reports from the database period-wise, data-wise, course-wise, etc. 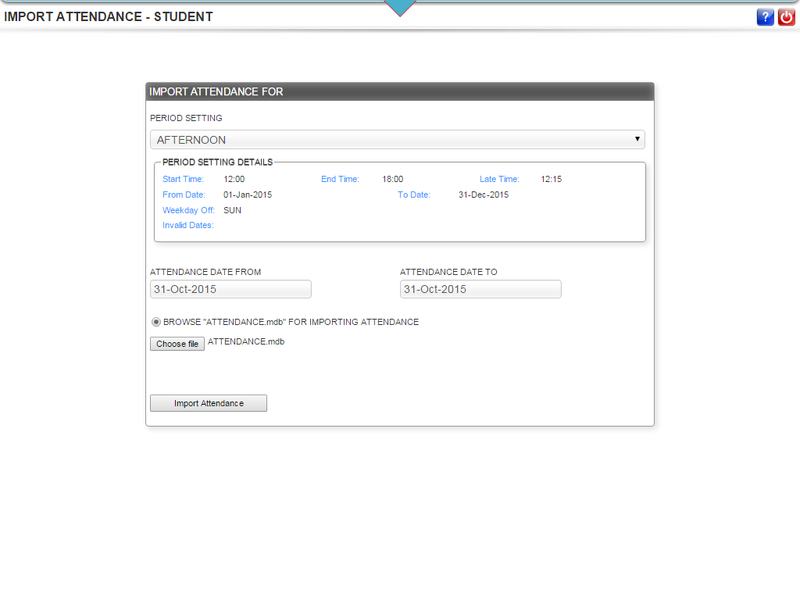 Students can also view their attendance report into the student dashboard by logging in to their account. ECAS helps you generate a detailed list of monthly attendance charts for a particular period or course. Yearly charts depicting day wise group attendance for every month can also be generated through ECAS. Time-in/time-out log reports from biometric devices and smart card machines can be obtained date-wise, day-wise, student-wise, etc. All these reports can be viewed and printed in different formats as per the management requirement. ECAS automates the whole attendance marking process, thereby saving time of the faculty and the class. Such a campus automation software helps to maintain accurate records of students and staff through time log reports.